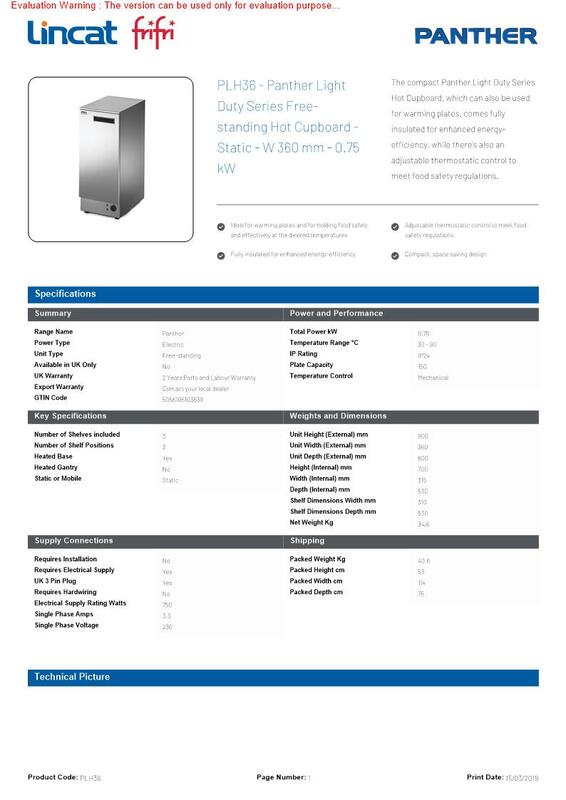 The compact Panther Light Duty Series Hot Cupboard, which can also be used for warming plates, comes fully insulated for enhanced energy-efficiency, while theres also an adjustable thermostatic control to meet food safety regulations. I'll like to know the rated frequency and voltage for your Lincat PLH36 Light Duty 360mm x 600mm Static Hot Cupboard? Is it 110V or 240? Is it 50Hz or 60Hz? Good Day! Rated frequency and voltage for this item is 230V 50-60Hz . The Electrical supply is 1N~+E and Current Rating (A).